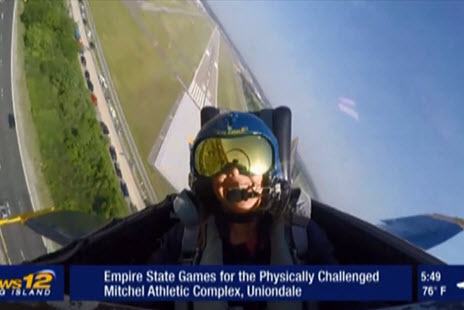 News 12’s Erin Colton takes a spin in the cockpit at the Bethpage Air Show held annually at Jones Beach. This free event is preceded by media flights with reporters and photographers flying with featured performers, multiple press conferences, social media outreach and other activities. Epoch 5 has helped build the Bethpage Federal Credit Union Air Show into Long Island’s largest public event, attracting as many as 400,000 people every Memorial Day weekend. Since 2007, we have worked closely with the credit union and the New York State Office of Parks, Recreation and Historic Preservation to brand this exciting event as the region’s Memorial Day weekend kickoff to summer. The event shares Bethpage’s rich history as the credit union for the Grumman Corporation and Long Island’s storied history in the aerospace industry.